The use of trains in the Great War is a neglected subject; railways were the super-highways of the day used to transport everything from material to men and horses. In the British and Commonwealth forces trains were operated by the Railway Operating Division (ROD) of the Royal Engineers which recruited men who had worked on the railways in civilian life to operate the trains on active service. 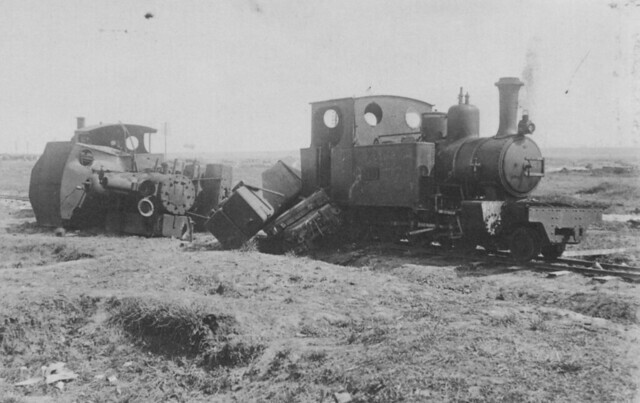 Depicted here are trains of the ROD abandoned on the Somme during the March Offensive of 1918. They were photographed by a German soldier at this time just off the Albert-Bapaume road close to the village of Pozières. The British had put in a railway system here as a Casualty Clearing Station had been in operation at this point in 1917 and the wounded had been brought in by ambulance and then moved further back by train. The trains had also brought up artillery ammunition for a number of shell depots that had been established in the area. The barren nature of the Somme battlefields at this time is evident in the background. This entry was posted on 25/01/2012 by sommecourt. It was filed under Artillery, BEF, British Army, Great War, Somme, Uncategorized, Western Front, WW1 and was tagged with Great War, Royal Engineers, Somme, Train, Trains, WW1. Amazing to think of the amount of line Laid during the war. Did the French incorporate any of the line into their domestic lines? My Great Grandfather was a Royal Engineer and senior NCO on railways in WW1. He was a gaffer on the railways in civy street before the war, just as the caption says. He was mentioned in dispatches and I still have the certificate, signed by Winston Churchill. I would love to find out more about his service. He survived the war.